Our school was founded in 1965, then as “Gymnasium Lauf an der Pegnitz”. In 1996 it was renamed after Christoph Jacob Treu, a scientist and physician from Lauf. In 2012 the school was awarded the title “Schule ohne Rassismus, Schule mit Courage”. The school building has been extended several times due to the constantly increasing number of pupils. There are roughly 1300 pupils and more than 100 teachers at the school plus about 10 administrative and secreterial staff. 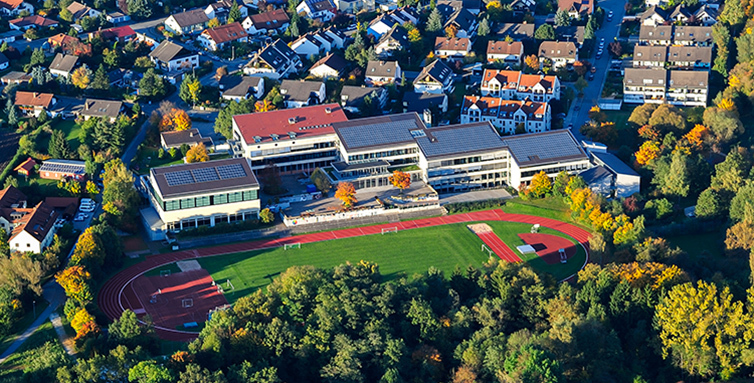 The school is situated close to the town center of Lauf and can easily be reached by public transport. The school also receives financial support from the "Landkreis Nürnberger Land" as well as from external partners and sponsors. With the „Abitur“, which pupils in Bavaria normally get after 8 years, they can basically study every subject at every German university. In their education at the CJT, the pupils can focus either on sciences and technology or on languages. All the pupils do English in their first year, then they can add French or Latin and later also Italian or Spanish. For many years the school has been working on constantly improving in the field of pedagogics and didactics and also in matters of organisation of education, we have always been open to innovation and new ideas. Being in a constant dialogue with the parents, cooperating with them and giving them help and support is a priority at our school. In August 2014 our school was granted the title „Modus-Schule“ by the Bavarian ministry of culture and education for a third time. This title allows us to try out new ways and methods in all fields of our daily work, in teaching, cooperating with parents, working with the pupils etc., which have not (yet) been official and legal. In all our work we see the encouragement of our pupils, with all their very different and diverse talents and interests as a top priority. We want to do “Gute Schule” to get things right and strengthen the people.